Southern California firefighters face another day of brutal heat as they try to protect homes and contain a suspected arson wildfire that forced evacuations in mountain communities and burned homes in Riverside County. Temperatures will remain above normal in the 90s to 100 with low relative humidity in the San Jacinto Mountains, where firefighters are attacking the 12,300-acre Cranston fire. 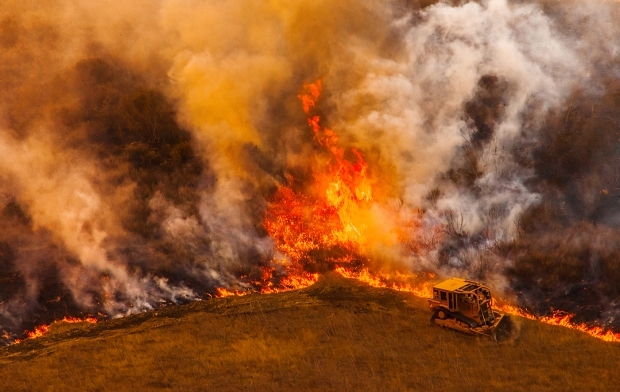 The wildfire, one of several burning during a dry and extremely hot summer in California, has destroyed at least five homes since it started Wednesday about 100 miles southeast of Los Angeles. 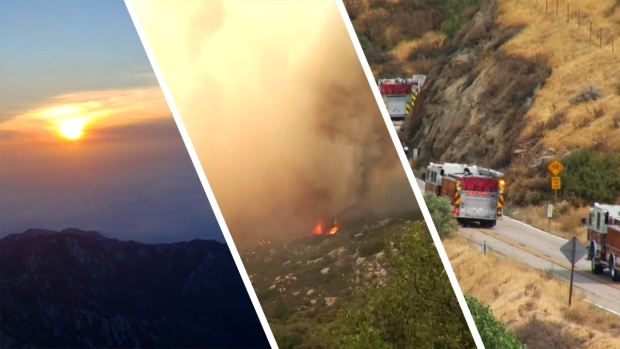 The fire continues to threaten about 4,900 buildings after forcing road closures and the evacuation of 6,000 people in Mountain Center, Idyllwild, Herkey Creek, San Jacinto Mountain State Park, Fern Valley, Pine Cove, Cedar Glen and the northern section of Garner Valley, according to the U.S. Forest Service. 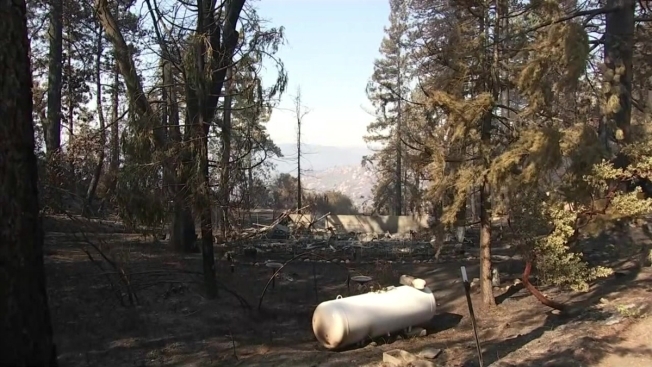 "The ones that are very easily defendable are the ones we're going to take priority on," said Cal Fire Capt. Scott Visyak. "The ones that don't have defensible space or have a lot of overgrowth, it's just a recipe for disaster. But we're going to try to save every house that we can." Defensible space is a barrier around the home designed to prevent fires from spreading to buildings. Defensible space is considered the area 100 feet around the home, usually cleared of brush and anything else that doesn't offer a fire break. Containment was at 3 percent early Friday. Investigators said the chain of destruction was likely set in motion by a an arsonist. On Wednesday, not long after the fire sparked, a 32-year-old man was taken into custody. Winds have been calm in the area, but firefighters have faced the warmest temperatures of the year as they enter the third day of the firefight. An excessive heat warning was extended to midnight Friday. 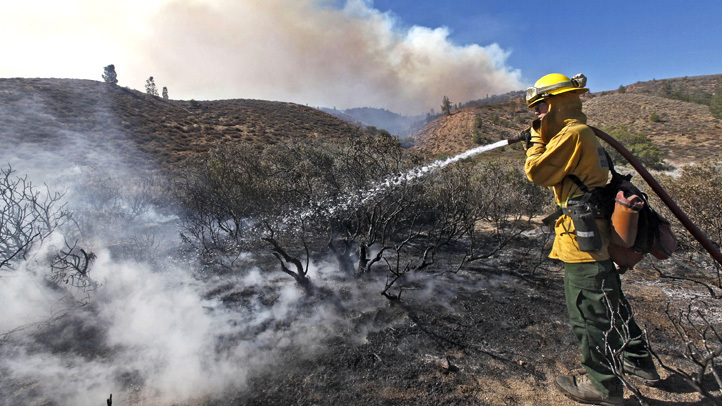 It's anticipated the blaze could spread to a number of mountain communities, including Idyllwild, Mountain Center and Lake Hemet. Mandatory evacuation orders remain in effect for those areas and were expanded midday Thursday to include the communities of Pine Cove, Fern Valley and Cedar Glen. Gov. Jerry Brown on Thursday issued a state of emergency in Riverside County, which clears the way to provide needed state resources. The fire was burning "with a rapid rate of spread" through timber, brush and chaparral, according to the USFS, which reported that more than 1,000 firefighters from across the state were taking part in the containment efforts. In Northern California, a chaotic situation unfolded overnight when an explosive wildfire that killed a bulldozer operator burned dozens of homes. The Carr fire tore through two small Northern California communities Thursday before reaching the city of Redding, forcing homeowner -- many of whom had little warning -- to evacuate. Cal Fire has reported nearly 3,400 wildfires this year across California that have burned about 99,000 acres. In 2017, the state's firefighting agency reported 3,200 wildfires that burned more than 216,000 acres through the first seven months of the year.